Walking into Mark Dagley’s “Structural Solutions” at Minus Space is like accidentally wandering into the middle of a peculiar standoff. Three strong, distinct energies surround you, pushing and pulling, bandying you about. To your right a hulking, sharp figure, smartly outfitted in what Niele Toroni might refer to as a Red red and a Black black, towers above you. It just fits into the space, a few inches shy of scraping the ceiling. Almost intimidating. You bounce a few degrees to your right and are softly buffeted around for a while by a big, long grid. A double stripe of off-white separates squares of color, not many of which, if any, are exactly the same hue. The particular dime-store paperback shade of the off-white calls to mind a plaid. A big gaudy handbag or window dressing backdrop pulled out of a department store basement. You feel a little dusty inside, melancholic. Another pivot puts on offer the most sympathetic, approachable of the three. A mediator, maybe. A shallow rectangle of long, cool blue and yellow diagonal stripes with crisp, meaty L’s incised vertically. Smart and funny, not hard to look at. You could hug the thing. Mark Dagley, Structural Solutions. Left to right; Lucifer (134 x 115 inches), The Mackintosh Variations (104 x 120 inches), and Janet’s Dilemma (75 x 156 inches). All work 2012. Image courtesy of Minus Space. Further (!) Dig this clip of Dagley’s (and George Condo’s) punk band The Girls making it up as they went in 1978. “Mark Dagley: Structural Solutions,” Minus Space, DUMBO, Brooklyn, NY. Through October 27, 2012. 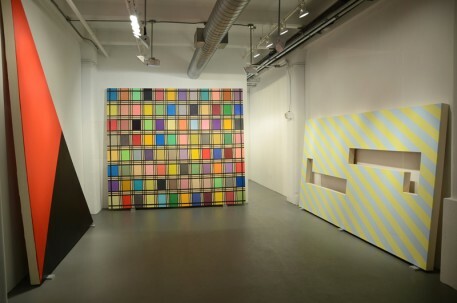 Concurrent with his exhibition at MINUS SPACE, Dagley is also presenting a comprehensive survey “Mark Dagley: 35 Years, 1976-2011” at Kent Place Gallery, Summit, New Jersey. September 10 – October 5, 2012.